I’ve been thinking a lot of late about just what are my favourite album cover designs of all time, and while an oredered list of my preferences seems to change daily, one thing that has become apparent id that a lot of my favourite covers are monotone. Just what that says about me, I don’t know, but I thought that over the next couple of weeks I’d discuss some of my favourite ‘monotone’ covers of all time. 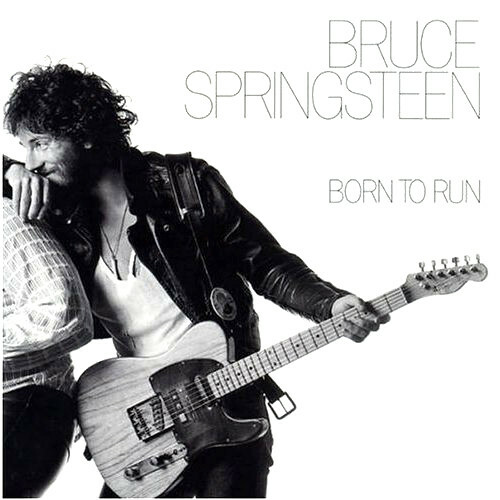 First up, Springsteen’s 70’s classic ‘Born To Run’. We’re probably all familiar with the superstardom he reached in the 80’s, but that wasn’t always the case. Up to the release of Born To Run, he had released a couple of albums that had received critical praise, but weren’t doing much on the charts, he had yet to transfer the energy and popularity of his live shows into any significant album sales. This was all about to change though. With his new album, photographer Eric Meola wanted to capture the character of Springsteen from his concert persona, but not with a traditional live shot. By using a black and white photo and a plain white backdrop, there would be nothing to distract from the figure of Springsteen the performer, the eye would go straight to his movement and shape. Meola was right on the money, the album cover has gone on to be one of the most iconic images of rock. It’s a beautiful introduction to the music on the album, Springsteen leans on Saxophonist and E-Street band member Clarence Clemens, illustrating how he had come to depend on his bandmates to help him encapsulate the full scope of his songs. The stark black and white photo and a white background of a cheeky grinned Springsteen looking back at Clemens is a perfect accompaniment to the grandeur of the albums lyrics used to describe the seemingly mundane and every day events of his songs protaganists. Ultra thin lettering lets the photo tell it’s story in an elegant understated manner, a type treatment seldom used at the time, but now a design classic. The album is over 30 years old but still stands the test of time both musically and grapically, certainly benefiiting from the larger canvas of the vinyl album era.